Cavernous, cacophonous space: soaring ceiling, colossal columns, faux-antiqued walls, distressed mirrors and trompe l'oeil murals - one of the hottest after-theater hangouts on Broadway. While waiting for a menu, grab a crayon--supplied with the butcher paper tablecloths--and draw. A little Milanese, a little Venetian and a lot of fish and pasta. Try the swordfish carpaccio, antipasto spread or luscious pastas. 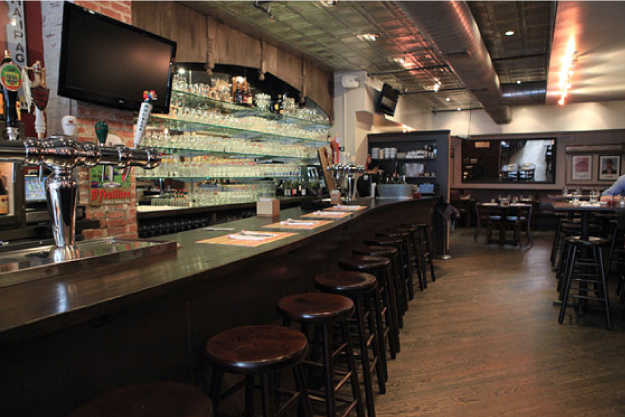 Voted best brew pub by New York Magazine, and a NY Daily Press People's Choice Award Winner. Widely known for brewing unique handcrafted beer, Heartland also wins accolades for freshly prepared food and specialties like handmade soda. Cozy décor, friendly staff, and seasonal menu items and beers make each visit to Heartland a mouthwatering and memorable experience. Authentic Belgian bistro serving great Belgian fare and carrying an extensive list of imported beers. Menu features awesome burgers as well as classic delights like mussels accompanied by authentic Belgian frites! Monday is unlimited mussels night. Saju Bistro breaks the midtown monotony. Retreat into a modern, elegant oasis for a culinary alternative. The well designed menu will make your pre-theatre, post-theatre experience feel like a trip to St. Tropez en Provence. Captures the essence of Authentic Old NY Italian cuisine with its ambiance, decor, great value and delicious home-style recipes in platters that comfortably satisfy 2-3 hungry diners. Individual plates are also available.